History has been made in the NFL this summer as the very first full time female coach has been hired by the Arizona Cardinals. 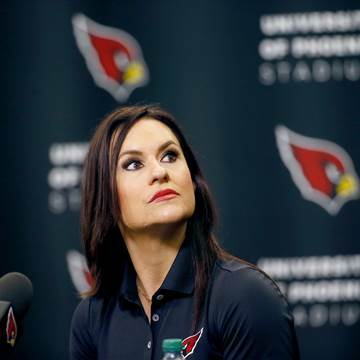 Her name is Jen Welter and she has proven herself to be a valuable asset to what once was only thought to be a man’s world, and she will certainly be adding diversity to the program and professional football. The Florida native was brought on as a training camp and preseason coach at the end of July, and despite not having any experience playing football it is believed that she will be able to help the Cardinals get ready for the new season this fall in a big way. This is a great movement by the NFL because it is showing how the culture of this country is starting to broaden their horizons and be more open minded to an equal equality working environment in male dominant fields like sports. Welter might be new to coaching in the NFL, but she is not new to the sport or to coaching overall. She was the coach for “semi-pro” women’s football and even led Team USA to win gold medals in the 2010 and 2013 American Football Women’s World Championships. In addition to that, earlier this year she was introduced to the Texas Revolution as their linebackers and special teams coach which is when she really got her foot in the door to this opportunity with the NFL. Welter isn’t even just a sports fan and enthusiast, but she also studied sport psychology and got her master’s in that field from Boston College and her PhD in it from Capella University. Welter is officially the first woman to coach a men’s professional football team and hopefully she won’t be the last. As long as a person, no matter male or female, can do the job better than anyone else they should be given the chance to show that neither race nor gender has a barrier on that. If your company is interested in finding out availability and booking fees for a professional football coach like Jen Welter, or other sports celebrities for a Graduation Speech, Fundraiser Event, Guest Appearance, or Football Camp, call us at 1-888-246-7141.